What if you knew there were 13 challenging outdoor fitness trails dotted around London parks, unknown to millions of the capital’s residents? Jason and Fiona Doggett know the benefits of training outdoors, more than most. As directors of outdoor personal training firm Muddy Plimsolls, they’re experts in showing clients how to get fit using bodyweight training and the capital’s outdoor fitness trails. 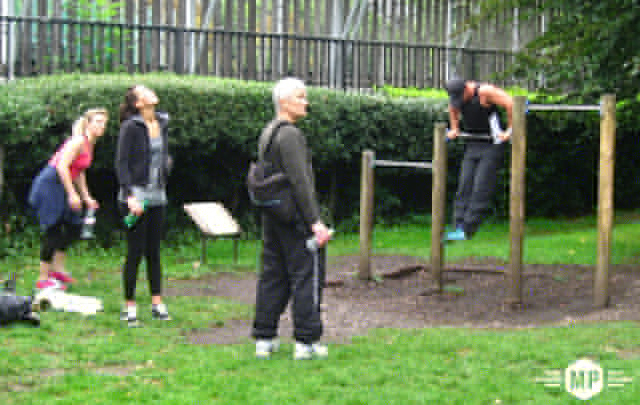 But when they learned that many of the exercise sites in London parks they’ve used were not listed or publicised anywhere, even by local authorities, they couldn’t just sit around and let Londoners continue missing out. Because these are the sites nurturing a grassroots fitness revolution and turning outdoor bodyweight training into a staple feature of park-based activities. Cardio-fiends are now combining their training with strengthening calisthenics. And outdoor fitness enthusiasts performing press-ups in a park is as common a sight as weekend footballers enjoying a friendly game. So Jason and Fiona set out on a personal mission to photograph every significant site in central London. Along the way, they also developed a rigorous rating system. Top marks go to the facilities that offer the greatest variety of equipment, training space for cardiovascular conditioning and superior nearby amenities. Now you can not only find outdoor exercise parks near you, but you can also feel confident you’re making the most of them with highly effective site-specific training tips from Muddy Plimsolls. The results are in – check out the new outdoor fitness map for a full breakdown of their findings! Primrose Hill won their top accolade as the Royal Park is the site of Muddy Plimsolls’ own outdoor personal training sessions. But they also loved Parliament Hill in picturesque Hampstead Heath, Kennington Park with its obstacle course of fitness equipment, Victoria Park’s comprehensive exercise facilities and the purpose-built New York style bar park in Wormwood Scrubs. Whether you’re based west or east, north or south of the river, the team at Muddy Plimsolls has located a fitness playground convenient to you. Many of them offer something special: a unique piece of fitness equipment, an unrivalled view, or historic woodland running trail. All of them provide a rewarding challenge for people of all fitness levels. While London’s outdoor fitness community continues to flourish, Muddy Plimsolls remains at the forefront of a revolution shifting the parameters of exercise. And, like the rest of the in-the-know calisthenics community, they understand the amazing benefits of adding a programme of simple but challenging bodyweight exercises to any fitness regime. Wherever you are. Check out Muddy Plimsolls’ map of London’s most popular outdoor fitness locations. Then take your outdoor fitness training with one of Muddy Plimsoll’s flexible training plans. Come rain or shine, Muddy Plimsolls promises to take your training to the next level.